Two remote-controlled mechanical spiders, carefully hidden in the shadows of a tour bus. Frequent Nerf gun wars. One well-loved fedora. Many pairs of sunglasses. A planned trip to Lardo. And a quintet playing bluesy, sensitive-but-fearless rock and roll, anchored by the UK’s ascendant rock star of the moment. 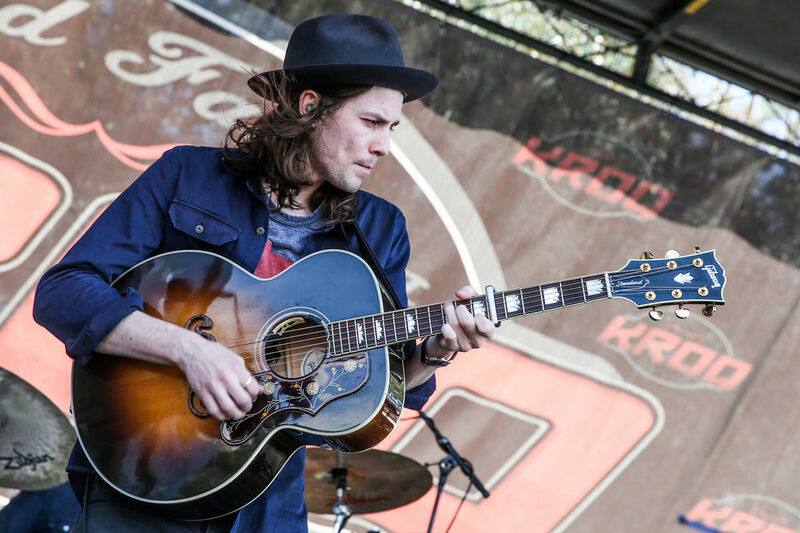 They’re ingredients in James Bay‘s American tour, which stops at the Crystal Ballroom Aug. 5 for an all-ages show with Tor Miller. Bay’s last year has included a record deal (Republic/Universal); a new album, “The Chaos and the Calm,” that hit No. 1 and was certified gold in the United Kingdom, and went to No. 15 in the U.S.; the 2015 Brits Critics Choice award and others; fawning press coverage and sold-out shows. While the 24-year-old said the speed of the ride is only increasing lately and admits it can “get a little wearing,” he comes across as an uncomplicated chap. Bay’s sound is straightforward: He and his quintet make music the old fashioned way, rocking out mid-tempo numbers with voice, vintage guitars, keyboards, bass, drums, few effects pedals — not a laptop or blinking anything in evidence. “I love those classic sounds, those real, organic sounds,” he said. “They sort of showcase emotion. The naysayers don’t bother him, though. Crafting songs is “incredibly personal and incredibly difficult,” he said. When he writes in tandem with others, he’s doing the same thing he did growing up, when he would “back and forth it” with his brothers. And if songcraft is not his greatest gift, who cares? Not his fans, who appreciate the fat, polished sound and predictable emotional catharsis good pop songs provide, and happily sing along to melodies that lodge in the ears. For his part, Bay comes across as the kind of musician who wouldn’t mind sitting down with detractors, jamming a little, and debating things like authenticity while citing liner notes from 1960s and 1970s albums by Bob Dylan and Aretha Franklin. Not that he’ll have much time to hang out during this tour. Bay said the plan is for just 36 hours in Portland, “unanimously a favorite for everybody” in the band. Plus there’s that trip to Lardo for sandwiches, not to mention all the hijinks and pranks with keyboardist Jack Duxbury and drummer Gerry Morgan.